The new Godwin CD150S Dri-Prime dewatering pump is designed for tough mining and construction applications. Xylem has launched the latest in its series of smart pumps under its Godwin brand, specifically designed for difficult mining and construction applications. 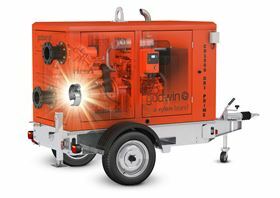 The company says the new Godwin CD150S Dri-Prime dewatering pump, part of the Godwin S Series, offers greater flexibility due to its interchangeable impeller which expands the application range of the pump. The CD impeller can now be exchanged with Flygt N-Technology non-clog impeller to tackle stringy, modern wastewater applications with the same pump. The pump’s compressor belt tensioner reduces the time taken to change and adjust the belt to approximately 30 minutes and the addition of a new sight glass allows operators to accurately monitor the level and quality of the pump’s mechanical seal oil, cutting overall service time by 40%. The CD150S is also compliant with EU Stage 5 emissions standards and can be equipped with Field Smart Technology, Xylem’s Cloud-based telematics platform that enables the Internet of Things (IoT) across the entire Godwin S series. Using cellular, satellite and GPS technology, customers can track, monitor and control the pump in real-time from any smartphone, tablet or desktop computer.